You Survived the Interview&#8230;Now What? You Survived the Interview…Now What? His response: “I think it went well and they said they’d call back for the next portion.” A day goes by. Then two. Then three and I’m realizing my brother hasn’t given me an update. So, (like any big sister would do) I inquire about a callback to which he informs he has yet to receive one. The time to sink away and disappear in hopes that you will hear from an employer or recruiter is not during the first few days (or week) after an interview. The impression that you leave with a potential employer does not end with the final handshake. How you handle yourself after the interview can seriously influence the way that the company looks at you. The most important thing that you can do after an interview is follow up. In today’s market the appropriate way to do this is through email (although a former manager told me he was intrigued to receive a written follow up). The recruiter should provide you with his/her business card, which should include the person’s full name and email address. Even if he/she doesn’t, you can most likely access this information from the company’s website (or initial contact email sent to you). Use this information to send your follow up. Also, if as the interview is ending you notice the recruiter or hiring manager does not provide you with this information, don’t hesitate to ask for it. Say thank you. This actually starts before you even walk out of the interview room. Shake the interviewer’s hand and thank the person for his/her time. Afterward, send a personalized thank you note to the interviewer. Tailor your message. Mention something specific that was said in the interview or something that happened during your interaction to indicate that the message is individualized and to remind the interviewer who you are. Remember hiring managers may interview dozens of people for the position, and it is easy to get people confused. Make sure that you stand out from your competition. Get to the point. Don’t worry about making your thank you note long or profound. In fact, a short, sweet, to-the-point note is much more effective than a long treatise that seems to be just another cover letter or a plea for the position. Just as recruiters skim resumes because of time I’m certain they don’t have all day to read lengthy emails. Restate your purpose. Subtly emphasize in the thank you note how much you appreciated the interview and that you desire the position. A simple “I look forward to hearing from you!” or “I hope to speak with you again soon!” is a friendly way of closing the thank you note while also putting in another nudge for yourself. 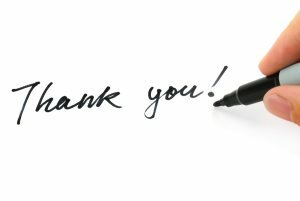 Remember, you’re not truly sending the thank you note because you enjoyed the interview process; you want the job. Remind the recruiter of your purpose. Be persistent. Do not aggravate the recruiter by constantly pestering him or her, but it is good to remain in touch by occasionally checking in. Use your check-ins to inquire about how the hiring process is moving along, remind the recruiter of who you are (subtly—don’t blatantly say “Do you remember me? I’m the one that talked about XYZ”) and further indicate that you are committed to that specific position and company. While the thank you follow up note should happen no more than 48 hours after an interview, preferably within 24, it is appropriate to wait a week after the follow up in order to check-in for the first time. You don’t want to seem desperate or pushy. Remain positive. Feel confident that you did the best you could throughout the process. Also, remember that every interview you do is an opportunity to build your professional network. A positive, friendly attitude can be an asset when companies interact with each other. You may not get the position that you interviewed for—but you may be suggested to another company because of your attitude.